With 10 years of experience in the F&B business, and over 150 outlets across China, it’s almost absurd we haven’t heard of Yun Nans sooner. Its name sounds disappointingly similar to a homegrown hair care brand—the chain is actually known known as Yun Hai Yao (云海肴) in China—but the fiery fare from this first-ever international outpost impresses. 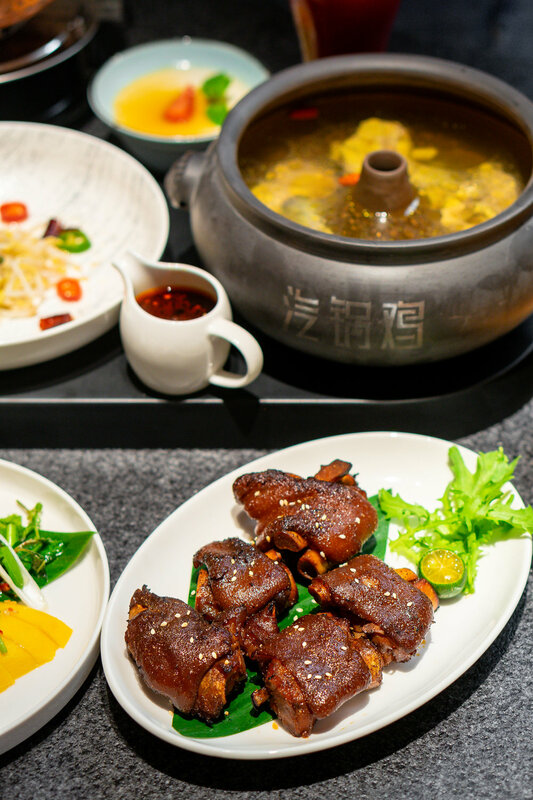 The restaurant specialises in highland cuisine, featuring earthy ingredients—such wild porcini, wild black truffle and other ingredients commonly found in the high, hilly plateau of the Yunnan region—most of which are brought in fresh from the province for their signature dishes. One such dish is their Steamed Pot Chicken Soup ($23.90), made using only a particular breed of black feet chicken, brewed using a unique technique that interestingly does not require a single drop of water. The result is a a delicious, flavour-packed chicken broth. You can also enjoy the tender meat, shredded and mixed with side of sprouts, add-on of cold rice noodles (if you’d like), and a splash of their piquant, homemade Mala sauce. 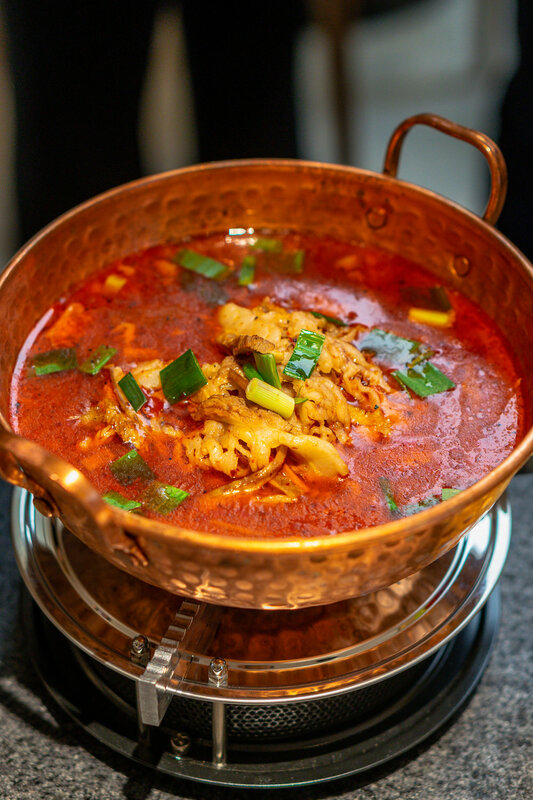 Looking like a twist on Shui Zhu Yu Sichuan Boiled Fish, the Beef Stew in Copper Pot ($24.90) presents an intense beef broth studded with beef shin, tendon and offal, then topped with preserved vegetables. The spice is a delayed one, but the flavours are tempting enough to keep us slurping more. Other dishes I enjoyed include the gelatinous and peppered Pig's Trotters and the refreshing Spicy & Sour Egg Salad, reminiscent of our local Achar, but with addition of fried egg. 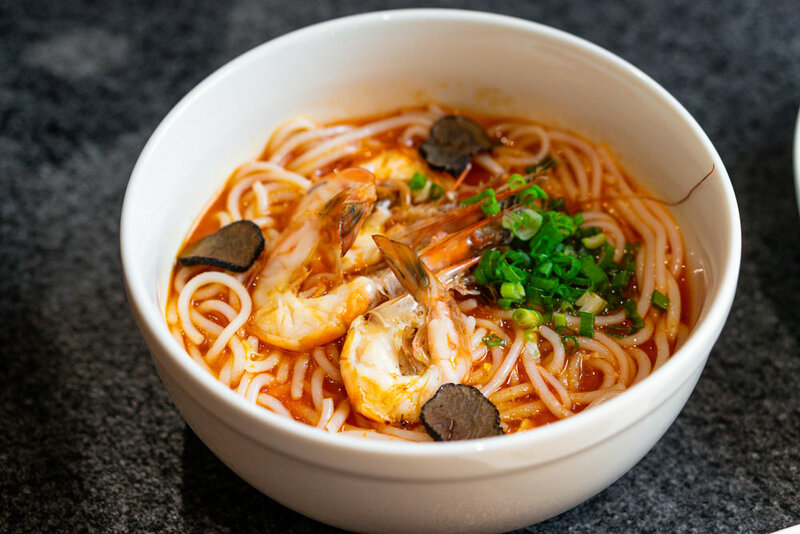 The Yunnan Rice Noodles in Prawn Broth with Black Truffle is a new creation that’s exclusive to our island. Borne from the inspiration of our local prawn noodles, the visual resemblance was also its downfall I feel. The specially imported Yunnan rice noodles made with their spring water has a nice and light bite, but while tasty, the broth just lacks that depth and punch. Overall, the offerings from Yun Nans is quite vibrant and exciting (sans their take on prawn noodles). There is a liberal use of spice across the menu—be it in the form of pepper or chilli—so if you’re a spice-nonfan, do ask the staff for recommendations.